We started today’s walk back at Hampton Pier, on the outskirts of Herne Bay. 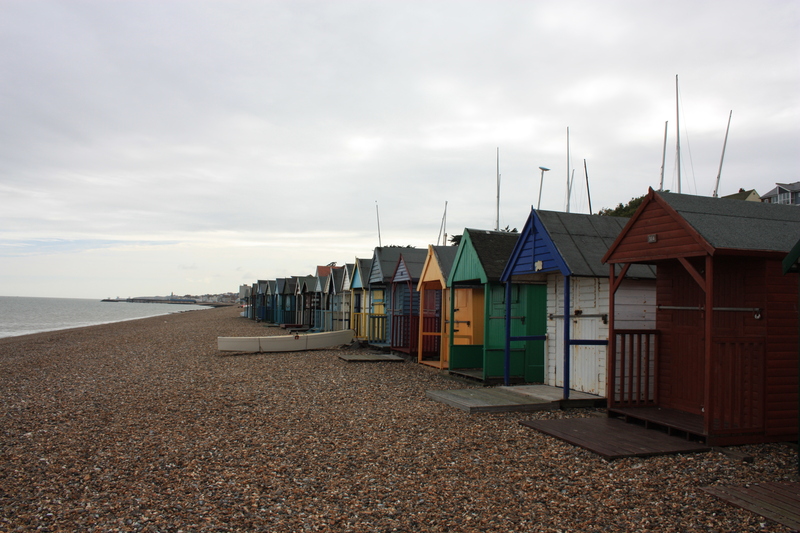 The sky was overcast, although the beach huts tried their best to bring some colour to the day. 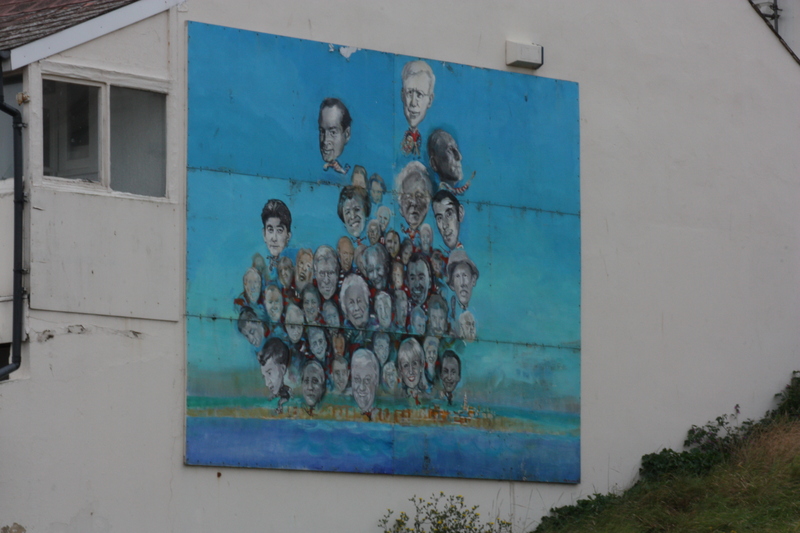 We walked towards the centre of Herne Bay, seeing a large mural on the side of a building just before the pier. Herne Bay has several prominent murals which are the result of a “Cultural Trail” around the town. We only saw this one, called Famous Faces of Herne Bay. This mural features many faces, some of whom we recognised and some of whom we didn’t. They include Ken Russell, who filmed on the pier, and Bob Hope, who as a child apparently fell off it. At the top of the mural is Sir Barnes Wallis, the inventor of the bouncing bomb which was used in Operation Chastise, the Dambusters Raid, in World War Two. 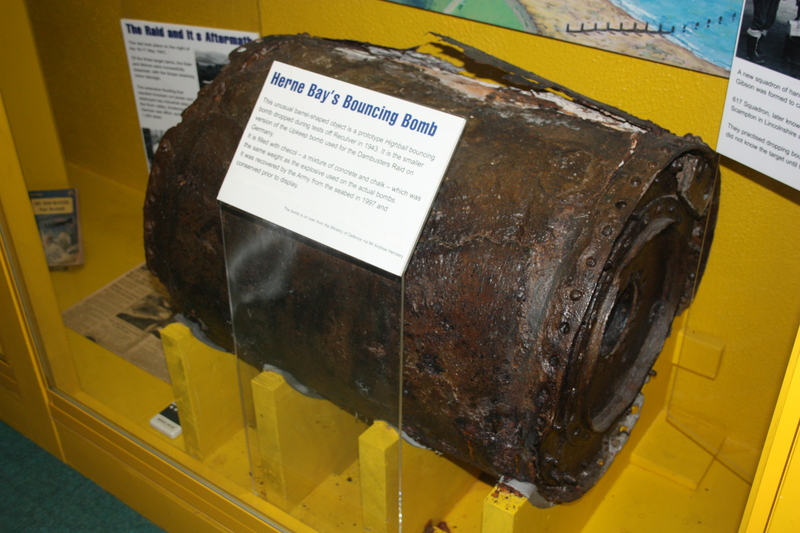 The bouncing bomb was tested off Reculver, just up the coast. We visited Herne Bay’s Museum which had a prototype on display. It was dropped during tests in 1943, and then recovered from the seabed in 1997. 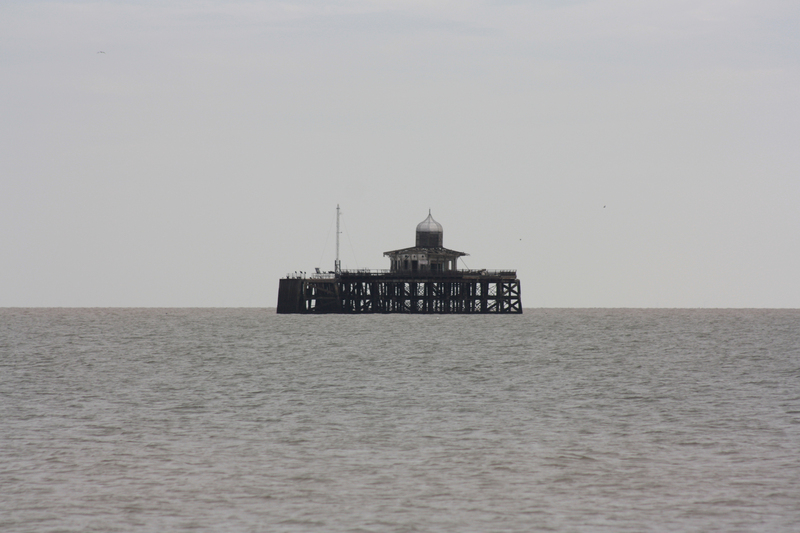 Herne Bay’s poor old pier is in a rather sorry state today. Rather, it is in two rather sorry states, as the middle section is missing. At one end is the stub of the pier foot. At the other is the head of the pier, way out at sea. 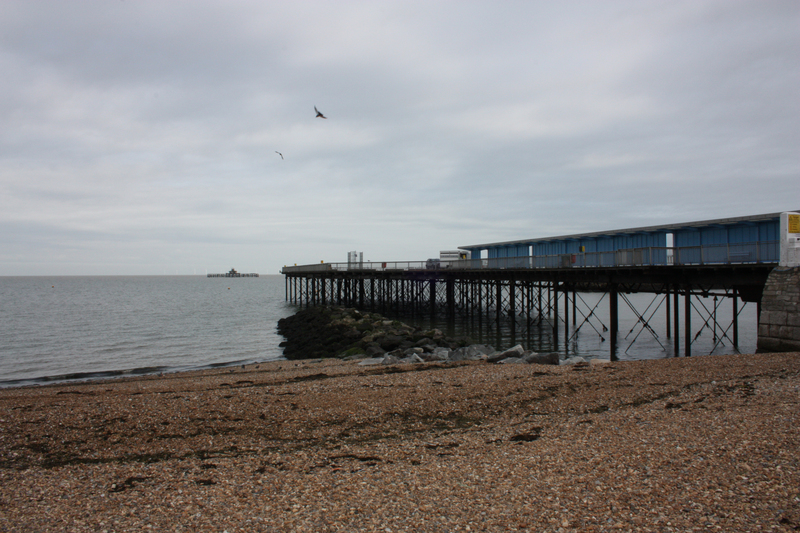 Herne Bay’s first pier was built in 1831-32, and was 3,613 feet long. It extended into deep water, allowing steamers to bring in tourists. However, the wooden piles which supported the pier were attacked by shipworm. Whilst many were replaced with iron piles, the attack was too severe and in 1870-71 the pier was demolished. The second pier was, quite simply, too short. Built in 1871 it provided promenade entertainment, but ships could not dock, and thereby a valuable source of tourism was lost. The third pier was built during 1896-99. 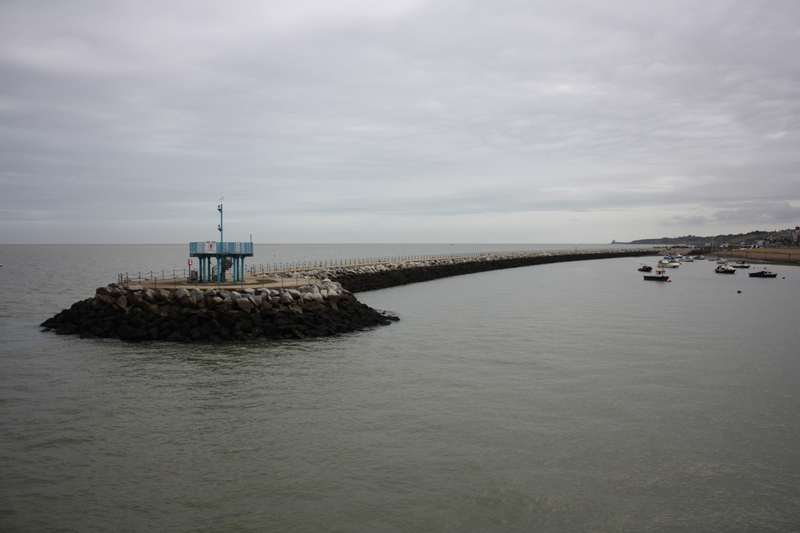 At 3,787 feet it was the second longest pier in England after Southend. This third pier survived a fire in 1928, but its middle section didn’t survive being blown up in 1940 by the army, to prevent the possibility of an enemy landing during the war. The army bridged the gap with portable “Bailey Bridges”. They also compensated the Council, though the compensation was not enough to pay for permanent repairs. Over the years storms, tidal damage, ice thaws and neglect all played their part in its downfall. In 1978-79 storms caused part of the middle to collapse, and the remainder was then dismantled in 1980. The pier head was deemed too solid for demolition, so was left stranded out at sea, a patient sentinel waiting for reconstruction to give it a new lease of life. The foot of the pier was home to a sports centre, but that has recently been relocated and the area cleared. There is now a serious proposal to rebuild the pier, reuniting the two severed ends. We took a wander up the foot of the pier, looking east to “Neptune’s Arm”, a breakwater constructed in 1993 which provides a small area of quiet anchorage for local boats. Once we left the pier we quickly arrived at Herne Bay’s Central Bandstand. It was too early in the morning for any formal entertainment, so we found ours by an alternative method: we acquired two of the most ridiculously large ice creams ever to have existed. The kids look quite smug in this picture. But these creamy delights contained an entire microcosm of glaciers, crevasses, mountainous peaks and, I am convinced, Eskimo villages. 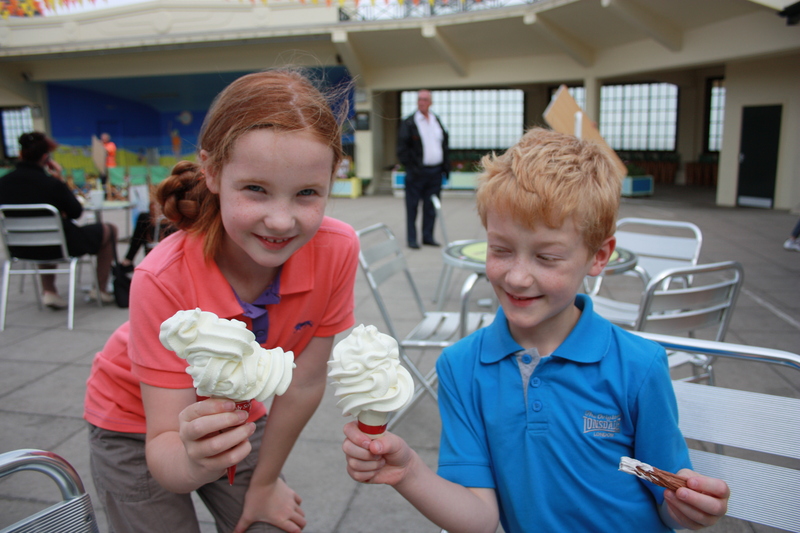 As our children craned to lick up the avalanches of melting Mr Whippy before it dripped over their hands, tiny emperor penguins dived for their lives. These ice creams were truly monsters of the confectionary world. Finding the flake was like hunting the needle in a haystack. A little later, my daughter complained of a tummy ache. Perhaps she just needed a good meal to give her some energy, was one suggestion. I think quite the reverse was true! Having finished their ice creams, the kids listed their way over to the world’s first ever free-standing clock tower, built in 1837. At its base stand two cannons. 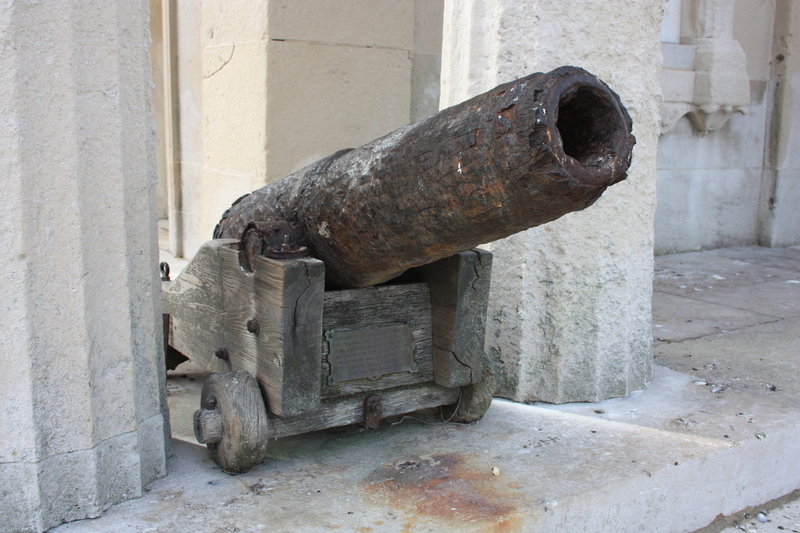 These had stood on the original pier and were fired as warnings in fog. They were thrown overboard when the pier was demolished, but were salvaged in 1899 by divers working on the construction of the third pier. 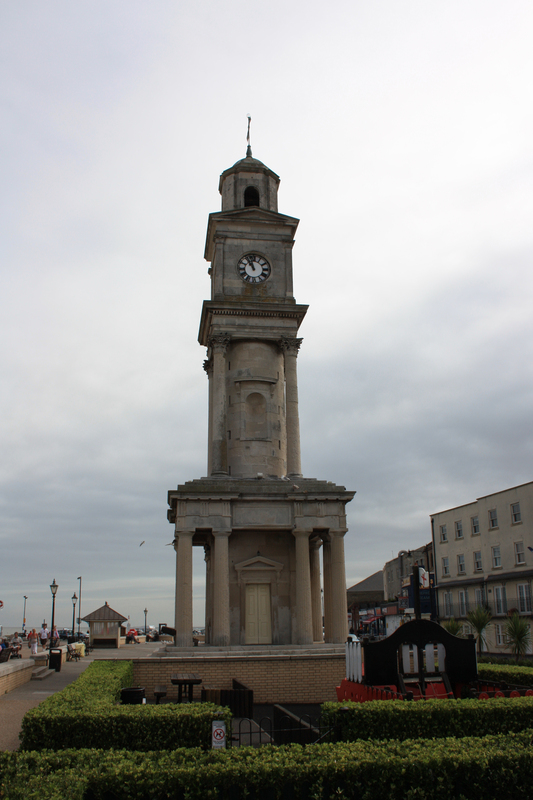 We left the clock tower and moved on, out of Herne Bay and on to the next stage of our walk. 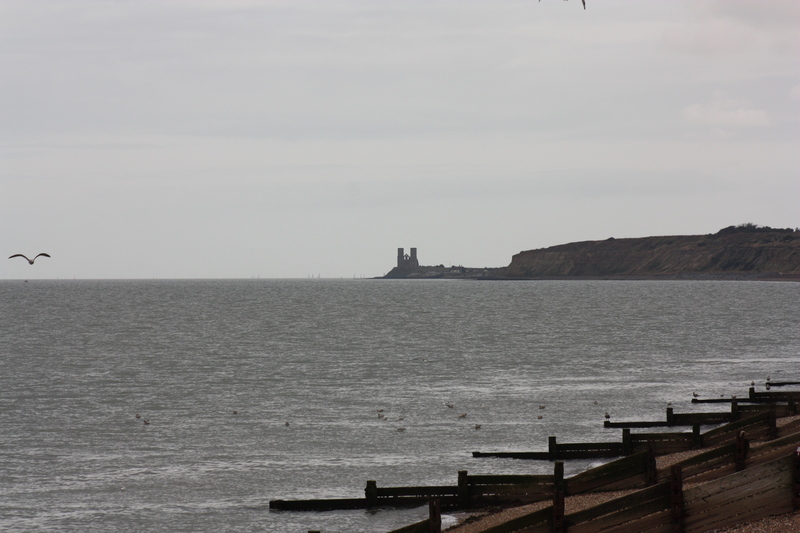 The twin towers of St Mary’s at Reculver beckoned to us in the distance. This entry was posted in Kent and tagged bouncing bomb, clock tower, coast, dambusters, herne bay, ice cream, Kent, mural, pier, reculver, travel, walking. Bookmark the permalink. I had to look up shipworm and was quite surprised too! I just wanted to say thanks for this writeup. I’ve lived around this coast since I was born. I snapped this photo last year http://www.krisjbphotography.com/long-exposure/gvwf5ju78og75kf71vdoo8uzcvl3r4 but never gave any thought to the history.